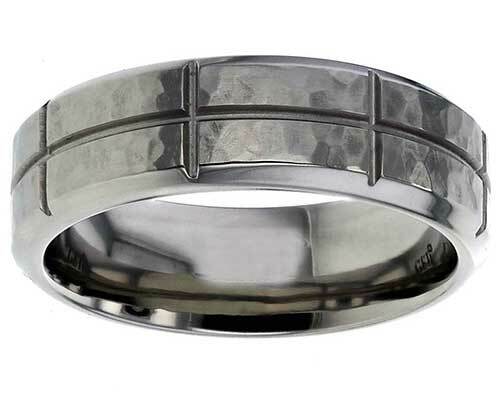 This particular men's wedding ring is a real design statement piece when it comes to hammered finish jewellery. It features expertly engineered panels that are machined perfectly to match in size around the outer of the ring. The panels are further divided centrally by another single deep groove running through the middle of the band. We love the simplicity of this design and even more so with the bevelled edging on either side of the hammered panels. The attention to detail is outstanding. A superb choice for a men's titanium ring, the 7mm width model pictured here is in a matt finish, but we can do polished also together with other widths too.